QUINCY — When Amanda Klane and Drew Harrington became best friends in an Easton kindergarten class, no one guessed they would one day develop the first marketed frozen Greek yogurt bar in the country. This month, the Yasso cofounders released the first pints of their indulgent, low-calorie dessert. Inspired by their love of athletics (and sweets), Klane and Harrington brainstormed the idea for a healthier alternative to ice cream in 2009, after they graduated college. “We just thought that there could be an opportunity to bring the best of both worlds to the dessert category,” Harrington said. Two years later, they went to market with three flavors of frozen Greek yogurt stick bars: strawberry, blueberry, and raspberry. Now, the Quincy-based company has 16 bar flavors. 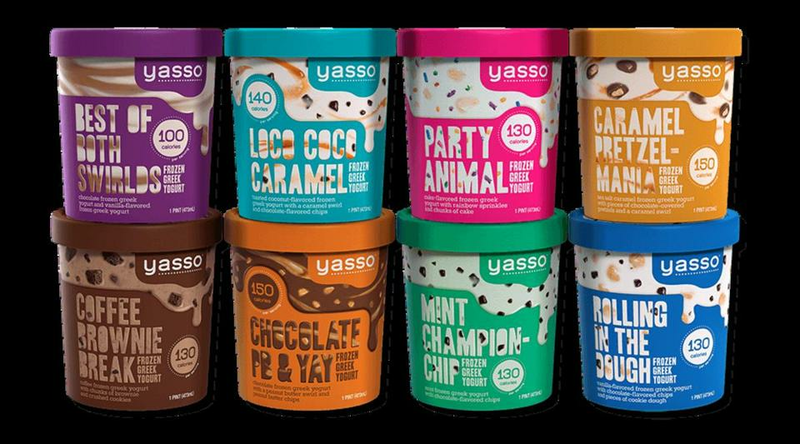 Yasso has added eight pint flavors. Best of Both Swirlds, Caramel Pretzelmania, Chocolate PB & Yay, Coffee Brownie Break, Mint Championchip, Party Animal, Loco Coco Caramel, and Rolling in the Dough have hit the shelves locally, and will be available nationally within weeks. What makes Yasso different from other low-calorie options, Harrington said, is that it’s free of the sugar alcohol erythritol, and other high-intensity sweeteners.